I love lapis lazuli. I probably use it way too often when I'm designing jewelry, but I just can't get enough of that vivid blue color. Here I am wearing the latest release from ELEMENTAL JEWELRY--The Moroccan Mood Necklace & Earrings, in Lapis & Silver. Have a look at the closeup below. Pretty. 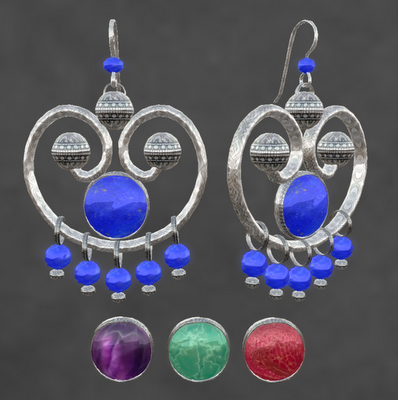 Of course, being the practical gal that I am, I also like versatility--so this set has texture changing stones in lapis, jade, amethyst, and red coral--lots of options without clogging up your inventory! Both the earrings and necklace are resizable for the perfect fit--and because you may not like your earrings quite as large as I do. And, as usual, if you hurry on over to ELEMENTAL this weekend, you can grab your own Moroccan Mood for a fantastic price! The earrings and the necklace are featured in the 60L Weekend Sale this weekend only. Hair: Truth Isidora in mahogany. Purchased at full price. Skin: Curio Pout 2 Sundust Light, Pure 4. Purchased at full price. Top: Zaara Yauvani tank top in electric. Purchased at full price.